Trump TV and the spawn of Satan devise an October Surprise: double-down on racism and anti-immigrant hysteria. President Donald Trump responded on Thursday morning to reports of a caravan of migrants moving through Central America toward the U.S. border by blaming Democrats for their purported “assault on our country.” The president was mimicking the commentators he was likely watching on Fox News, who urged Republicans to weaponize the caravan as an election issue ahead of next month’s midterms. A caravan of as many as 4,000 Honduran migrants has entered Guatemala, leading Fox hosts to spend much of the week trying to stoke fears that the migrants are “heading this way” with plans “to storm our border.” None of this makes much sense — the caravan would still need to make it through all of Guatemala and Mexico, and the Mexican government is currently deploying its own resources to stop the migrants. 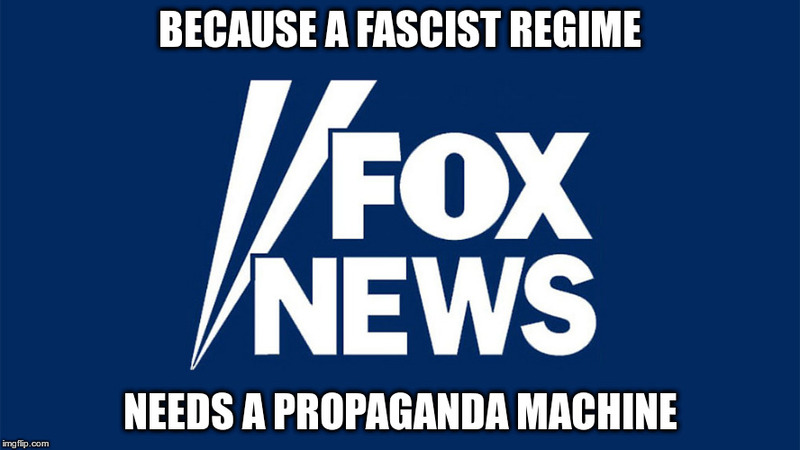 But because Trump’s worldview is shaped by the hours of Fox he consumes each day, that coverage is having an impact on U.S. policy — and now, the topics of discussion in the midterm elections. [F]ew figures in modern history have done more than Gingrich to lay the groundwork for Trump’s rise. During his two decades in Congress, he pioneered a style of partisan combat—replete with name-calling, conspiracy theories, and strategic obstructionism—that poisoned America’s political culture and plunged Washington into permanent dysfunction. 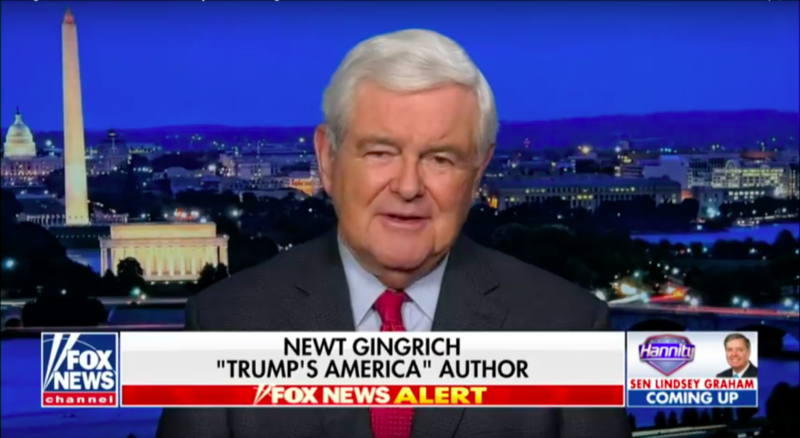 Gingrich’s career can perhaps be best understood as a grand exercise in devolution—an effort to strip American politics of the civilizing traits it had developed over time and return it to its most primal essence. 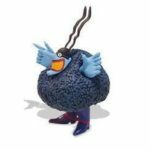 The devil should reclaim his spawn and take him back to the bowels of hell where he belongs. 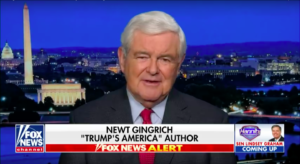 Of course, Fox & Friends – Trump’s unofficial White House staff – repeatedly urged Republicans to take Gingrich’s advice. This is not the first time Fox’s migrant coverage has triggered Trump to erupt on Twitter. In the spring, he similarly lashed out in response to Fox’s coverage of a caravan of migrants moving through Central America. 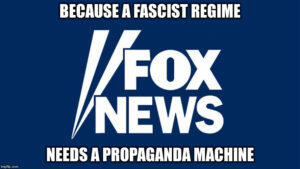 This Fox-Trump feedback loop presents a problem for journalists, as the president drives the network’s fearmongering coverage into the mainstream policy debate. President Donald Trump on Thursday amped up his focus on immigration ahead of the midterm elections by claiming, without evidence, that Democrats were behind a group of Central American migrants trying to reach the U.S.
“This will be an election of Kavanaugh, the caravan, law and order and common sense,” Trump said during a political rally in Missoula, Mont., referring to the nomination of Brett Kavanaugh to the Supreme Court. Trump flirted with conspiracy theories about the possibility that the migrants are being paid off, said money was being “passed through” those very people. Trump appeared to be referring to a video that Rep. Matt Gaetz (R-Fla.), a frequent ally, posted on Twitter on Wednesday that supposedly depicted migrants in Honduras “giving cash” to migrants in the Central American country as they set of for the U.S. Going even further, Gaetz called for an investigation to examine whether “US-backed NGOs” or the financier George Soros, a frequent subject of conservative conspiracy theories, were behind the alleged payments. Trump himself tweeted out the video on Thursday. So anti-Semitism against the “international Jewish conspiracy” for good measure. UPDATE: Rep. Matt Gaetz (R-FL) admitted on Sunday that he had provided false information when he tweeted a video of a “caravan” of Latinos who he suggested had been paid by liberal billionaire George Soros. “I was wrong,” Gaetz told CNN’s Jake Tapper. Regardless of what was actually being passed out in the video, where men are shown handing something to women waiting in line, there was evidence that the video was actually shot in Guatemala, not Honduras. So now we’re going back to that idiot Jesse Kelly’s bogus claim in the 2010 campaign that Dems Are Busing Mexicans In To Vote Illegally? Trump is recycling this old lie? UPDATE: To his credit, FOX News host Chris Wallace on Friday Called Trump’s Idea That Dems Behind Caravan ‘Preposterous’: “Let me say first of all the idea that the Democrats were somehow behind this caravan coming from Honduras of these women and children is preposterous and there’s been no evidence offered on that any more than there was evidence that the protestors on Capitol Hill during the Kavanaugh hearings were paid protestors,” he said. President Trump on Thursday lashed out at Democrats and the leaders of Latin American nations, seeking to deflect blame and mitigate political damage by riling up his base just weeks before the midterm elections. Many Republican candidates, especially in Senate races in states Trump won in 2016, have modeled attack ads on Trump’s rhetoric, aiming to raise public fears over the dangers of illegal immigration. The Trump administration has been in contempt of court for months refusing to comply with a federal court order to reunify families separated under its now suspended “zero tolerance” family separation policy. Federal judge orders Trump administration to move forward on dozens of asylum claims. As we have seen here in Arizona, Republicans are all-in on Trump’s moral depravity of racist anti-immigrant hysteria in their campaigns. Sadly, it is effective with far too many voters.